3) it has a very high concentration of ACTIVE INGREDIENTS. 5) the function of a serum is to give an extra boost of good ingredients to your skin (just to be clear: the function of a cream is to be emollient and hydrate to the skin… therefore wishing to create “the ultimate hydrating serum” is like expecting to bake the best cake in the world without an oven: if you want hydration, you make a cream… if you want to feed your skin with an extra-boost of vitamins, antioxidants, anti-aging ingredients and sooo on, you make a serum). PHASE A – will still contain water, glycerin and a gelling agent (or not, but I will explain this later… so keep reading 🙂 ), but you will have to pay attention to which gelling agent you choose: you need to choose a gelling agent which won’t break down in presence of salts or other tricky ingredients (for example carbopol ultrez 21 is one of these difficult gelling agenta). For instance xanthan gum or hydroxyethylcellulose are good gelling agents for this purpose (in case of hydroxyethylcell. remember the gel is formed only at 70° so you will need to heat your water and, only when it is cooled down, proceed in the making of your serum). You will need different emulsifiers from those which we have used up to now: you will need actually two emulsifiers (one lipophilic at 0.25% and one hydrophilic at higher percentage) which are liquid and don’t need to be heated! There are many on the market. Actually you could even use a solubilizer to keep together the emulsion (solubilizers are substances which are used to solubilize small small portions of oils into a lot of water: generally they are surfactants. In case you have a solubilizer at home and you want to use it as a hydrophilic emulsifier: add the oily substances of the serum in your becher and, little by little, add drops of the solubilizer until all the solution in your becher becomes milky white. Then add this solubilized oils into your Phase A). PHASE C – actually the Phase C could almost be deleted since you can almost always add the active ingredients directly to the Phase A (do not add them only if you use hydroxyethylcellulose as gelling agent because in this case the Phase A has to be heated and active ingredients are thermolabile). The percentage of ACTIVE INGREDIENTS in a serum can be extremely high. Sometimes you could even make a serum using an active ingredient as a gelling agent! An example is the enriched hyaluronic acid serum which you can find HERE: this is also very easy to copy because there is not even the need of adding an emulsifier. Let me know if I forgot to explain something or you have any questions. Thank you so much for writing this! It’s been very difficult to find info on making serum and your article has helped emmensly! I do have a few questions for you. I’m making a brow serum. I would like my ingredients to include water, glycerin, and my performance ingredients-which are all oils. Can I add hylauronic acid serum to this recipe as the emulsifier? If not, what would be some emulsifiers you would recommend? I’m trying to stay as natural as possible but I’m open to all your suggestions. Lastly, if I’m understanding correctly, I will use 70% water & 1.5-4% oils (active oil soluble ingredients.) How much glycerin would I use? One more question, what preservatives would I need to give it a decent shelf life? Any help you can offer would be greatly appreciated. 2) Hyaluronic Acid is not an emulsifier so if you want to use 4% oily active ingredients you will need a real no-heat emulsifier or a solubilizer (for example PGE-10-laurate – which is a very aggressive surfactant/emulsifier. It is not very eco-friendly but you will need very few). Which active oily ingredients you would like to use? Hi, I’m wondering you state that before adding HEC, the water has to be heated to 70 degree.After adding it into water, does the temperature has to be maintained while mixing it? Hyaa I am back again. You’re incredible, how many information I should learn from you 🙂 I always see you amazing DIY & feel happy. For sure I am going to try out one of them & show you. But I will bother you with my questions. About water too 100, I road it hundred time but I am sorry I didn’t get it. I have to tell you something. Do you remember my request I think long time I didn’t check it out. I will pass around here and check your new DIY which I am sure it will be beyond the beauty. Can I ask you for one thing plz ? I think no more for this intru with you you’re my friend now :). Can you post for us the methods of making the correct way to soluble the cosmetic powder like Vitamin c Glutathione , ALA and AHA ?? I think the reader should know how to learn the basic things before making any professional DIY, Is I am right ?? Sorry if I couldn’t be of much help. This is exactly the article I have been searching for!! I am somewhat of a novice at the more complicated DIY skincare. I have been making my basic DIY Vitamin c serum for a while, and started getting into more complex formulas over the last year or so with a hyaluronic acid, B5 serum, BUT I have yet to include oils for fear of separation and most of all, bacterias. I have first-signs-of-aging AND moderately acneic skin and so most products on the market either dry me out (ie more wrinkles) or break me out, or are incredibly expensive, so I feel almost obligated to DIY my own skin care. I also have a little setback in that I live overseas in Spain and so some ingredients are a little hard to find. I do use one website to buy all my potion needs, but could you please explain specific types of lipophilic and hydrophilic emulsifiers?? AND, I just want to make sure <i understand clearly…. if the formula of my serum does not contain more than 1.5% oil/fat, then it is NOT necessary to use an emulsifier?? SO in other words, if I only want to add a few drops of essential oil to my serums, then it's ok to just shake and use??? Thank you in advance and now I am off to scour your blog for more hidden treasures!! Hello Heather! I am not American and I can assure you, you can buy almost every ingredient inside EU with no problems. There are so many websites that sell ingredients (I have used many from Italy, Spain, UK, France, Germany, Poland…) So nothing to worry about. However! I have many recipes I make using usually methyl glucose sesquistearate + cetyl alcohol. You could buy these two or you cpuld buy already “complete” emulsifiers like, for example, olivem 1000, montanov 68 (if I remember the commercial name correctly)! Just surf these websites and read what they suggest for use: if they say to use between 3% to 5%, try using at 4% and then make few experiments to see what’s the difference and what works best for your formulation! Hi. I dont know if i understand correctly, is porlysorbate 20 or 60 the emulsifier to add to the water? You could use those if you need to add a low percentage of oils. Remember to solubilise the oils into the solvent before adding them to the recipe. If it`s ok for you, please would you look at my recipe ? Than I mixed 2 in 1. Was it too much Poly, I remembered I read it has to be 1:1 to oil? And on my face this was so sticky. I still watn to use it up, I just shake it before. It was a small batch, only 30 ml, so do you think it is ok to shake before use? I kinda don`t want to throw it away. Sclerotium gum needs a heated phase and has to be added to the water phase BEFORE other ingredients. If there are oils, it will not gel properly. But all this recipe is a little problematic. What is “sea emollient”? Is it electrolyte? Vodka will destabilyze things and it is very high and you added it to the oil phase (why?). But why would you add idebenone? Plus I am not convinced about the 1:1. You should have checked before if the oils + polysorbate were transparent when mixed together. And polysorbate is not a good ingredient to keep on the skin at such a high amount (my opinion here). The thing is: when you formulate you need to have in mind a CLEAR idea of what you want your formula to be for. Mixing every cool active ingredient you can find, is TEMPTING but you should avoid that. So, sclerotium goes in A, take away vodka and the active you wanted to dissolve in it. Change the polysorbate with a real emulsifier and make a cream jf you want 12% oils. Otherwise keep polysorbate but no more than 1.5% oils. The Sea thing sounds like a strong electrolyte but it should be ok with sclerotium. Ah Licorice Extract – is it powder? If so, lower it to 0.2%. Powders destroy stability. You already have 5% Niacinamide (but usually it is fine cause it dossolves). About NAG I have no clue: never used, don’t know its suggested concentration or pH or anything. Is the pH of all the ingredients compatible with the Niacinamide? I wrote so much, I`m not sure if you got my comment. I saved it to clipboard meanwhile =) . I don`t want to double-post it. Hi It’s All in my hands. I absolutely have found this blog to be sooo inspiring – you are a wealth of information and so very generous with the help you give to people! 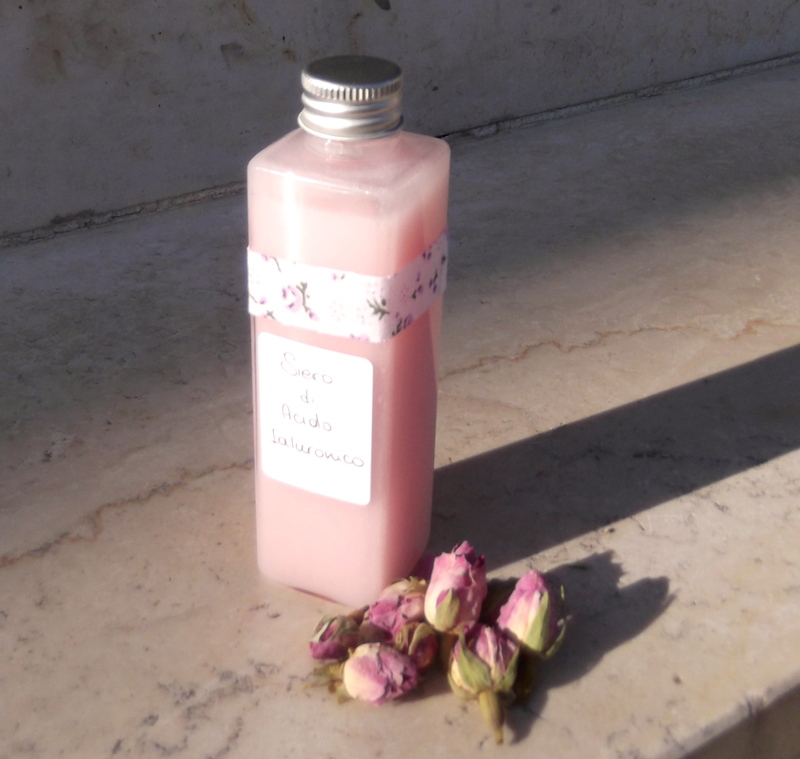 organic rosehip oil, organic camellia oil, organic pumpkin seed oil, essential oils of french lavender, carrot. During the preparation state, I kept the two phases separated, the water from the fats (oily based) – heated both to 70 degrees then cooled and started mixing. Afterwards I added the essential oils. Three days later, the oil is in a clear jar and has 3 separate sections – the water is on the bottom, oils in the middle and a slight layer of foam remains on the top. As per your comment below, is there need for an emulsifier or can it be done otherwise? Well there are quite some issues here: 20% oils is a lot and it is difficult to make an emulsified cream as liquid as you want it to be, specially with such a high concentration of oils. – a stabilizer/thickener that will help the phases stay together. Every emulsion is unstable so you have to enhance stability. A liquid emulsion is difficult to get and anyway there are specific emulsifiers to get one. Finally: a facial serum shouldn’t include oils more than few percent. If you want more oils, you want a cream/lotion and not a serum. Ah crap, sorry, but I had to crash close my linux yesterday, so of course file wasn`t saved. I have to write all over again. I will try today, when I`m back at home. No I haven’t! Ok do one thing: please copy-paste it in a facebook message on my facebook page? 🙂 so we can continue there! I was looking for more info to enable me to make my own serum. I’m really hoping you can help. I’d like to make a mix with distilled water (main ingredient), pure L-ascorbic acid (didn’t determine yet), pure vitamin E (up to 5%), glycerine (a few %). I have to add some emulsifier because of vit E but not sure exactly what to do there. I’ll put in ascorbic acid as much as the ph allows (it needs to be around 3). I’ll check this with strips. I’m not in EU or USA so I don’t have great choice of lab ingredients available. I have no access to more stable forms of vitamin C and I don’t know how to conserve this, so I’d make a small batch weekly or even every few days and keep in fridge. I barely got a hold of glycerine. Please help me with the ratios. Or maybe – this might be smarter – I should just add the vitamin E into my oil mix that I apply at night for skin care and apply this on top of serum – oils will penetrate. But in that case, how to improve the formula, maybe to add 1-1.5% of vitamin E into the water based serum mix? I’d make it weekly anyway and store in fridge in dark bottle, I think vitamin E would help prevent it from oxidizing. Please help me out with this??? Weekly won’t work as vitamin C oxidizes extremely quickly (hours). But I do have an article about a vitamin C serum using the ingredients you mention. You can apply later, after washing the Vitamin C off. But if you apply it while vitamin C is on, synergy will happen. You can indeed add vitamin E to the oils you apply in the evening! You can leave vitamin E on, and add it to your oils. Great news! Appreciate all your advice. Happy New Year! I am new in your website and you are amazing.I am trying to catch and learn everything you teach in here as I love to do natural mixes and lately I started just with hyaluronic acid serum from sodium hyaluronate and destilled water. I mix 1/8 tsp of the powder with 2 oz of destilled water. At night I mix a little bit of the serum with a pinch of ascorbic acid and apply it on my face. Tell me please if the formula for the hydrating HA serum is ok because I do not have anything to weight on grms. I will start with all your recipes and I would love that you please teach me how to make a serum with HA, matrixil 3000 powderand argerilne. I am a mature woman 55 and want to boost my collagen and diminiss my fine lines. I do not know how to do it and the one I buy it is very expensive. thanks for your help. Hello! I am using peptides as well, I just never posted a formula with them. You NEED to buy a very precise scale, though. Online you can buy one that weights until 0.01 grams for really few euros/dollars (I found one at 7 euros and it still works great). You really NEED the scale. You can make the serum and add to it matrixyl and argireline, however the latter works better together with another peptide commercially called leuphasyl or a similar name (sorry I am on my phone, can’t check better). You also need a preservative, of course. Just to tell you that I have the scale and the ingredients plus some B5 and would love that you can help me to make my cream or serum with the matrixil and argeriline and b5 if all of them work together. Maybe a HA with b5 serum to be as a booster ?lots of thanks in advance. Thanks so much for this information. I would like to make a serum using Hyaluronic Acid and Vitamin C. The molecular weight of the HA I have is 800-1000 kDa. Could you please give me an idea of the formula for this serum using distilled water and preservative? The following is my serum formulation.I am not sure it is ok or not?And also the procedures,can put all together and mix them? Can you explain what kind of serum you want it to be? Can you write next to each ingredient the reason why you are adding it? Please also add the percentages, as it is I cannot say anything about this formulation. Please also write the molecular weight of Sodium Hyaluronate. Please kindly check and comment. The reason why I asked you to write me the aim these ingredients were supposed to have in your serum was to try to understand if you thought about what is this serum going to do. 1) Lactic Acid. This is obviously an acidic ingredient. What pH do you want your serum to have? With Lactic Acid 2%-5% your pH is going to be around… 1 or 2! This is just DANGEROUS and the “benefit” it has for the skin is burning it (seriously burning it!). When adding acid or base ingredients to a cosmetic, you should first ask yourself what pH you want your cosmetic to have and THEN add as much lactic acid until you reach the intended pH (if it is a serum that is supposed to sit on the skin for hours, I wouldn’t go lower than pH 4.5). It also depends what AIM the lactic acid has in your serum: do you want a peeling effect? do you want a moisturizing effect? If you want a peeling effect, low pH is good. If you want a moisturizing effect then you have to buffer the acid with sodium hydroxide in order to obtain sodium lactate, which has great moisturizing properties ( I DON’T DON’T DON’T suggest you to actually do this: it is a dangerous process and you could hurt yourself mixing an acid and a base: you can purchase directly sodium lactate!). This said now there is an added issue: you have to check that ALL the other ingredients you are going to add are actually compatible with the 4.5 pH. Is your preservative going to work at that pH? Are other ingredients going to denaturalize? Are some ingredients unstable at that pH? 2) Ethanol: what is the aim of this 1% ethanol? What benefit does it give to your serum? 3) Sodium Hyaluronate: did I understand correctly that you add a 1% solution of SH at 4%? Because in this case it is not going to gel anything: it is just a moisturizing ingredient, which is fine, but it won’t do what you wrote you want it to do (you already have the gum which is going to gel anyway so you don’t actually need a second gelling ingredient). This said, there will be an issue with the SH and the acidic environment created by the Lactic Acid (whihc you are NOT going to add at 2-5% anyway, but add it until the pH is 4.5 at most). Sodium Hyaluronate’s pH is around neutral and if it is added to an acidic environment it tends to denaturalize. ps. Also depending on its molecular weight, it might actually be that it doesn’t gel a thing, that’s why I asked its molecular weight. 4) Sodium Phytate: a chelating agent and natural whitener ingredient for toothpaste (not skin, in skin products it doesn’t whiten and it is just a chelating agent). I have never used this ingredient but for what I read it looks like 3% is way too much and its suggested use is between 1%-2%, but I couldn’t understand if this was the suggested use in cosmetics or toothpaste. You also need to ask yourself: is sodium phytate ok at low pH? Because a part of it will become phytic acid. You need to read the information given to you by the reseller of the ingredient. 5) Last but not least: Benzyl alcohol on its own is not an effective preservative. It is usually combined with other preservatives. You also have to double check what is the pH range where it works. If it doesn’t work at a pH lower than 5.5, for example, you cannot go lower than that with your serum. What surfactants do you suggest and what should I mix first? do I need wax pastilles? I am new to cosmetics and I am doing for personal use now. Hello. Please read the comments either in this page or in the Hyaluronic acid serum page regarding the incompatibility of HA and Vitamin C. An oil in a serum is ok at extremely low percentages (0.5%) so it wouldn’t be able to do anything. I’d rather NOT add it to the serum so to not risk having emulsifying issues cause a serum is not not a cream so you don’t add a waxy emulsifier. If you don’t add the oil you don’t even need the surfactant. About the L-ascorbic acid, it is not stable, you cannot add it to anything unless you use it within a very short time so it would be a waste of Hyaluronic acid. So make the simpliest hyaluronic acid serum and use it before or after doing the vitamin C serum you still find here on my blog. Thank you! This is exactly what I was looking for. Took me a week to find you!